Click on Manafort to enlarge the cartoon. President Trump’s former campaign manager Paul Manafort was convicted on eight charges of bank and tax fraud. The judge ruled a mistrial on 10 other charges. The conviction isn’t related to Robert Mueller’s collusion investigation. 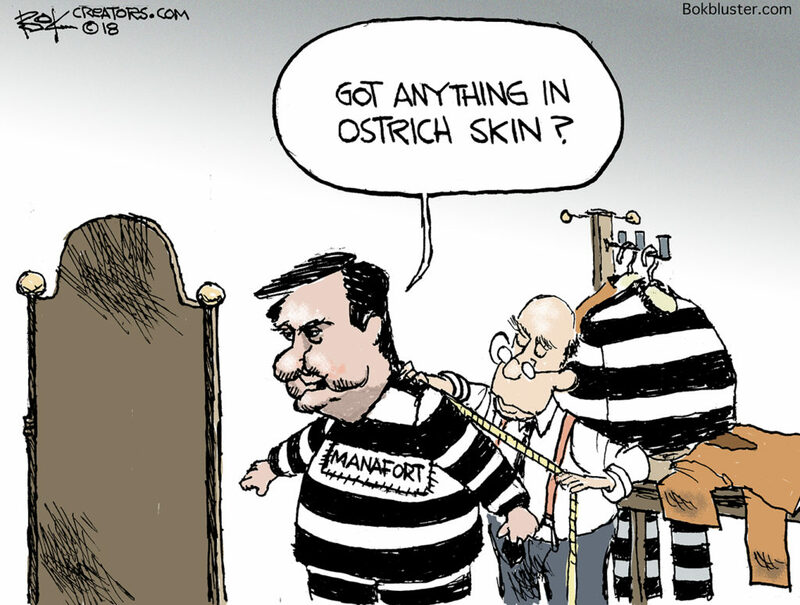 But maybe it was related to Manafort’s taste for the the finer things in life. He once spent $15,000 on an ostrich jacket. Not that there’s anything wrong with that. Except that he lied to banks for loans and didn’t pay taxes on $16 million. Vox follows Manafort’s money here. Manafort worked for Trump only a about a month. Before that, he worked for Ted Cruz for how long? a year?